Can anyone identify these marks PLEASE ?????? Can anyone identify these marks PLEASE ? Continental Silver two-handled dishes. 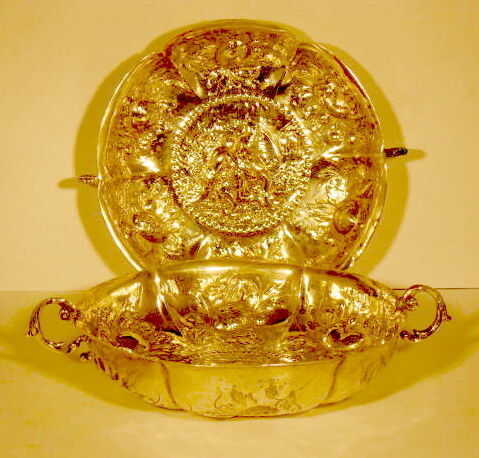 Having repousse work in the Baroque taste depicting classical figures at center and nuts and flowers around rim. Indistinct hallmarks on inside of rim. but the marks are rubbed and the pictures aren’t great. Could you post images of the pieces as well? There’s lots of marks to check and the style and nature of the piece will help us to narrow down the search. 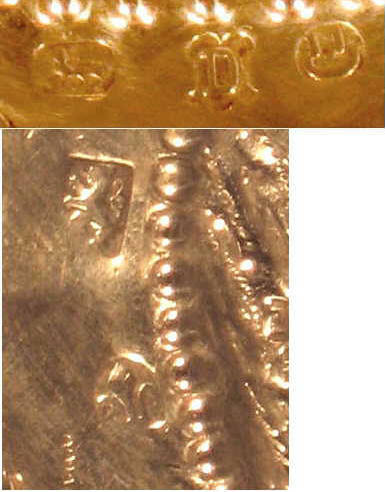 I have added description and photo to aid you in helping me identify the marks. You’ve got quite an interesting piece there. The item itself is in the style of a 17th century ‘saucer’ (Although it is more ornate than the originals). At the time, the term ‘saucer’ meant a shallow bowl used for mixing sauces rather than today’s meaning of a small plate for under your tea cup. I am pretty confident that the marks are spurious (fake marks). They are similar to various continental marks from the period of the original ‘saucers’ but not quite right. Collecting older silver became very fashionable in the Victorian period and a lot of reproductions were produced. Generally, these were marked inline with the hallmarking laws of the country in which they were produced and as such are easy to detect. However, The silver industry in Hanau, Germany produced a lot of reproductions with fantasy marks. The marks used varied but typically were chosen to be in keeping with the marks that would have been on the original. As such, my best guess is that they are late Victorian in period (which would explain why they are so ornate) and were probably produced in one of the workshops in Hanau, Germany.